Professional networking! Cutting-edge chemistry! Lobster rolls! The 256th ACS National Meeting & Exposition has it all. 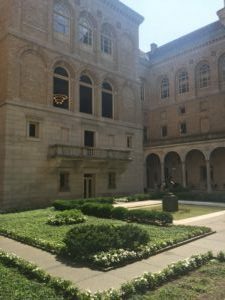 Thanks to the ACS Publications Travel Grant for Librarians, this year’s Boston meeting was one of the biggest and grandest conferences I have ever had the pleasure of attending. There was always so much going on that it was hard to choose between events, but I was guaranteed to learn something or meet someone no matter where I ended up. Although, that leads me to my first piece of advice for future attendees: Download the conference app before you go because it’s definitely possible to get a little lost. Indeed, there is no shortage of social outlets at the ACS meeting. I met undergraduates who were attending an ACS meeting for the first time, and life-long members who had been going for 30+ years. I talked with people at the expo, the poster sessions, the shuttle bus, the elevator, and the coffee line. The diversity of science experience and knowledge all gathered in one place was incredible. I also very much enjoyed meeting the other travel grant recipients, science librarians, and informationists at the ACS Division of Chemical Information (CINF) Welcoming Reception and CINF Luncheon. At my home campus, I’m the only librarian who covers chemistry, so it was nice to have a chance to commune with people from other institutions and companies who do similar work. My second piece of advice for ACS newbies would be to challenge yourself and attend at least one presentation with an unfamiliar topic. While it was great to talk shop, some really valuable conference experiences came from attending events in other fields. The Kavli Lectures for this year touched on some thought-provoking areas of research that I don’t regularly encounter. Professor Jill Millstone of the University of Pittsburgh discussed her work in manipulating the architecture of nanoparticles, followed by Professor Harry Atwater of the California Institute of Technology, who tied his research on highly efficient solar panels to the potential for light-fueled space travel. Without a strong background in either nanoparticle synthesis or photovoltaics, I admit that many of the finer technical points went over my head. However, attending these talks has given me direction for further reading and increased my awareness of current chemical research. This was one of my goals for the conference since I work with lots of young scientists who are applying for summer programs, jobs, and graduate schools. I’m excited to share my experiences at the ACS National Meeting with my students as we talk about science communication and what to expect as a chemistry professional. I also approached the ACS Expo with an eye out for employment and internship opportunities for students, but I was impressed with how large the ACS student programming presence was. If you’re coming to the conference as a student or a job seeker, there are plenty of career talks, resume and interview help, and a grad school fair at your disposal. And of course, you’re rubbing elbows with dozens of potential employers as you wind through the expo booths, marveling at the elaborate glassware and equipment displays. I did manage to make it out in Boston for some exploring, too. Browsing through Google Maps, I discovered a restaurant in the MIT area called “The Miracle of Science.” The menu items on the wall are formatted like elements on the periodic table, and given the chemistry theme of the week, I had to check it out. I am also a breakfast enthusiast, so naturally, I tracked down two different restaurants that make stuffed French toast and waffles all day. It wasn’t all about food, though. 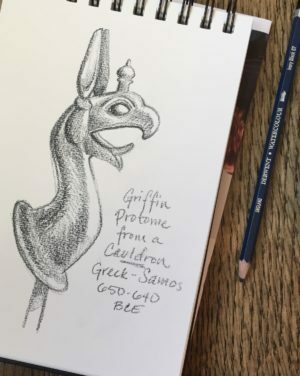 I went out to Cambridge to visit Harvard’s art museums and do some sketching. 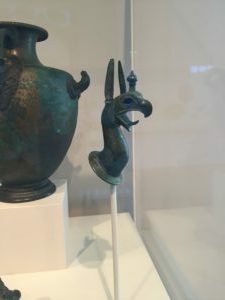 This little Greek griffin sculpture was a perfect model. 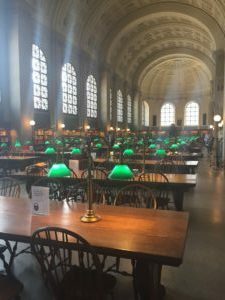 I also managed to fit in a quick excursion to the Boston Public Library before my flight home. I’d heard it was impressive but was not quite prepared for how beautiful it is. So that’s my third piece of advice: Take a little time to enjoy your surroundings. The ACS Publications Travel Grant was a fabulous opportunity on both a personal and professional level, and I would not have made it to the national ACS meeting without this support. As a new librarian, I feel very lucky to have had this experience so early in my career. A big thank you to ACS Publications for making this all possible! I’d also like to thank Michael Qiu for being a wonderful host and guide throughout the meeting. One last piece of advice: Once you’ve got all that conference swag stuffed in your luggage, don’t be surprised if the TSA gives it an extra thorough scan. I never thought I would be the person traveling with a chemistry-themed rubber ducky.